About Time director Richard Curtis directs Rachel McAdams. Domhnall Gleeson also stars. Elizabeth Banks and Ben Falcone in What to Expect When You're Expecting. The film is out now. Anna Kendrick strikes a pose in What to Expect When You're Expecting. The Oscar nominated actress talks the film. The men of What to Expect When You're Expecting. 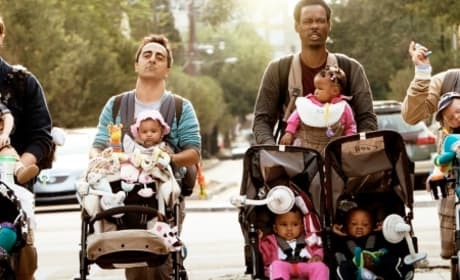 Chris Rock leads the pack. The cast of What to Expect When You're Expecting. The film stars Jennifer Lopez, Brooklyn Decker, Anna Kendrick, Elizabeth Banks and Cameron Diaz. Rodrigo Santoro in What to Expect When You're Expecting. The Brazilian star talks about working with Jennifer Lopez. Chace Crawford and Anna Kendrick in What To Expect When You're Expecting. Crawford talks about working with Kendrick. Jennifer Lopez stars in What to Expect When You're Expecting. Lopez dishes what it was like to film in her favorite genre, the romantic comedy. The film What to Expect When You're Expecting may have the best cast of the year. Cameron Diaz, Matthew Morrison, Jennifer Lopez, Elizabeth Banks and Brooklyn Decker lead the pack. What to Expect When You're Expecting star Cameron Diaz. Diaz is featured in a new video that parodies Dancing with the Stars. Adam Scott and Jennifer Westfeldt in Friends with Kids. The duo play friends who decide to have a baby like their married compatriots. Cameron Diaz works it in the trailer for What to Expect When You're Expecting. The film lands in theaters May 12.